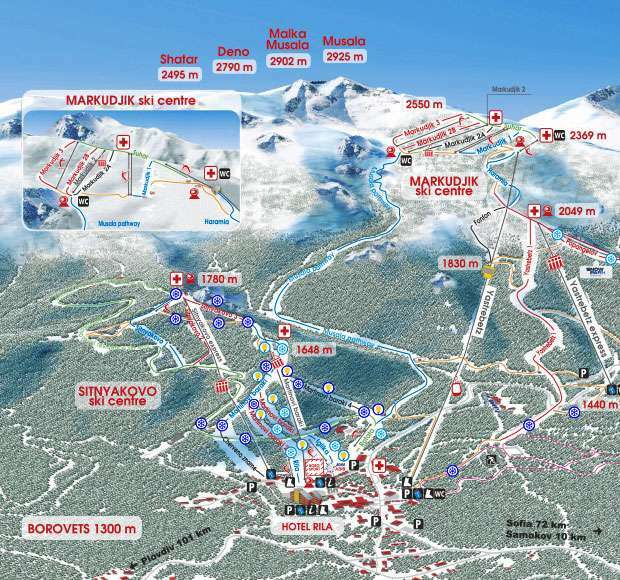 Borovets boasts 58kms of marked ski runs that vary in degree of difficulty suitable for skiers of all levels as well as 35kms of cross country trails. 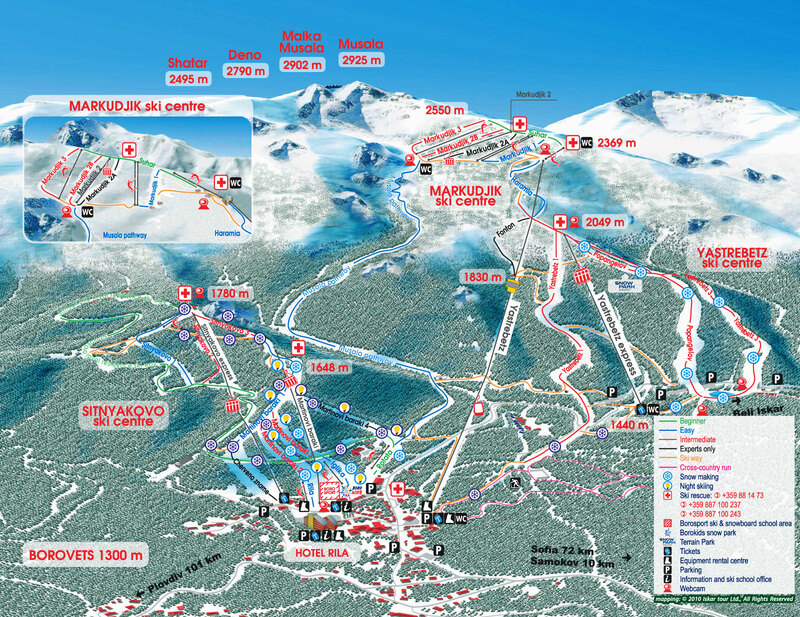 With a well-developed lift network Borovets can carry up to 15,600 tourists per hour and provides quick access to its ski runs. If you haven't discovered this premier ski resort yet, you're in for a treat! The Borovets ski school enjoys an excellent reputation where the friendly, helpful instructors make learning a pleasure and success guaranteed. Beginners start the week on the nursery slopes outside Hotel Rila but by the end of the week everyone is heading for the gondola lift and trying something a little more challenging. The choices for the intermediates are wide and various, with excellent skiing/boarding in the exciting Yastrebets and Markoudjik areas. The well-planned lift system includes the 5 km, 6-person Yastrebets gondola lift, which opens up a wealth of enjoyable runs, ranging from wide sunny boulevards in the Musala basin, to scenic looping trails through the trees. From the gondola taking you to the top you can try one of the longest downhill runs in Bulgaria, as well as some great skiing on the slopes of the wind-free basin underneath Musala peak. Advanced skiers/boarders can test their skills on the World Cup Competition run and enjoy skiing/boarding on the more difficult intermediate runs. There are opportunities for off-piste enthusiasts and more than enough diversions available to keep the most avid 'professional' busy. All ski lifts operate between 8.45am-4.30pm and are closed for half a day each week, and one full day each month for technical checks. Borovets opens early and closes late. Four runs are open at night with illumination and sound. All you need is to purchase a night pass valid from 6 pm. The runs are open until 10 pm every day. Night skiing is not included in the pre-bookable lift pass and other prebookable ski packs. Night skiing availability is subject to resort weather conditions.